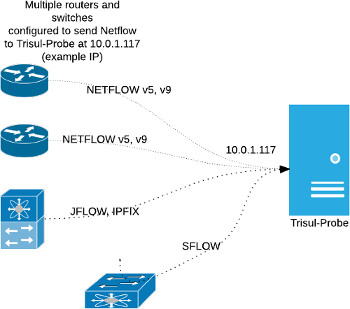 This section explains how you can setup Trisul in Netflow mode. 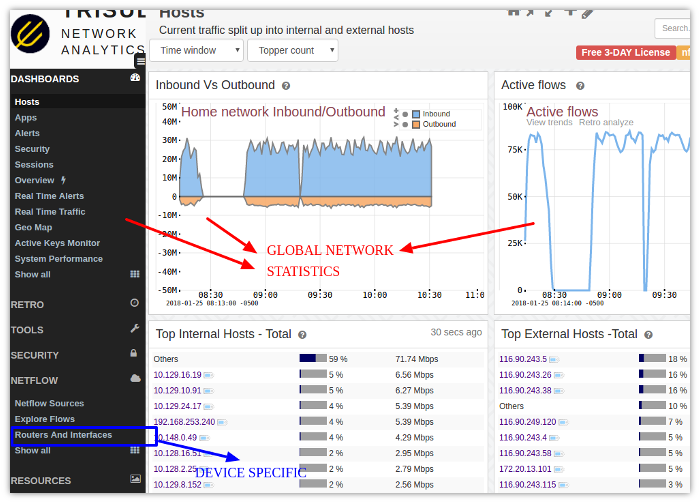 In this mode, Trisul uses Netflow and other flow telemetry to drive its analytics engine instead of raw packets. This section describes how to configure Netflow mode, to analyze from a Device perspective, and how to use advanced features such as “Interface Tracking”. Trisul supports Netflow v1, v5, and Netflow v9, Flexible Netflow, and all versions of SFLOW, and IPFIX. All routers and interfaces are auto discovered. Netflow is a very handy mechanism to acquire network data from a very large number of network elements in a cost effective manner. For maximum visiblity, we recommend you enable Netflow all over your network and send the logs to a Trisul context. The following diagram shows an example deployment. Trisul’s default input mode is raw packet capture. But Trisul also has comprehensive support for Netflow v5/v9/JFlow/IPFIX/and SFlow metering. TIP You can use Packet based Trisul to do full NSM (Network Security Monitoring) at perimeter and Netflow to gain visibilty into lateral traffic inside your network. This may be confusing for those coming to Trisul from traditional netflow solutions. Most of the Trisul dashboards are Global views that represent the sum total of all the interfaces in your network. If you see metrics for 8.8.8.8 it represents the TOTAL traffic to 8.8.8.8 from all the routers in your network. There is also comprehensive support for a Device View. You access that through the Routers and Interfaces tool. The Device View allows you to select a router then an interface on that router and then see the breakup of traffic within that. If you log on for the first time into a Netflow instance you may get a dashboard like below. The image below shows where to find the Router and Interfaces for getting to the Device Specific view.